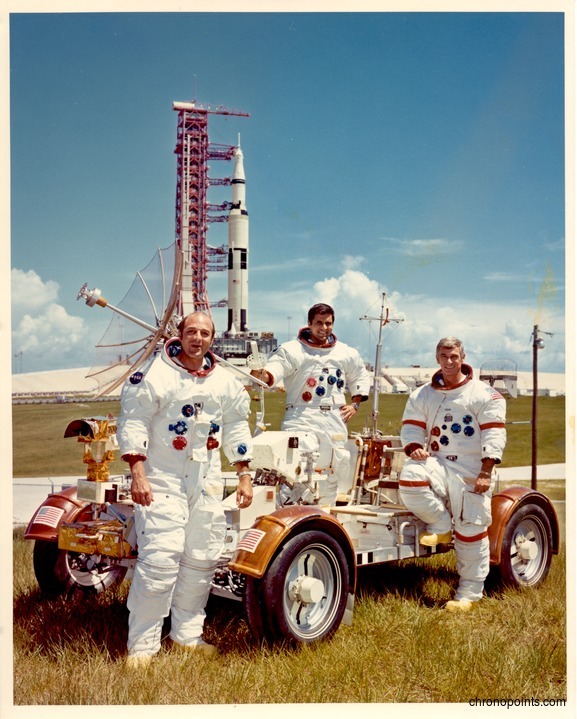 A pre-launch publicity photograph of the crew of Apollo 17 on September 30, 1971. This mission was the 11th manned Apollo mission, the sixth to put astronauts on the Moon, and the final mission of Project Apollo. Apollo 17 launched from Launch Complex 39A at John F. Kennedy Space Center in Merritt Island, Florida, on December 7, 1972, and returned on December 19. Photographed, from left to right, is Command Module Pilot Ronald Evans (1933-1990), Lunar Module Pilot Harrison Schmitt (1935-), and Mission Commander Eugene Cernan (1934-). Original color photographic print, September 30, 1971: Private Collection of Dr. Calvin D. Fowler. Digital reproduction of original color photographic print, September 30, 1971. Originally created by the National Aeronautics and Space Administration and owned by Dr. Calvin D. Fowler. "Apollo 17." National Aeronautics and Space Administration. http://www.nasa.gov/mission_pages/apollo/missions/apollo17.html. "Apollo 17 Prime Crew." Great Images in NASA, National Aeronautics and Space Administration. http://grin.hq.nasa.gov/ABSTRACTS/GPN-2000-001151.html. National Aeronautics and Space Administration. 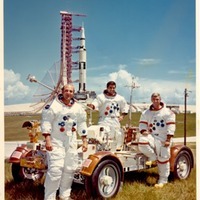 “Apollo 17 Crew with Lunar Rover Trainer and Saturn V.” RICHES of Central Florida accessed April 18, 2019, https://richesmi.cah.ucf.edu/omeka/items/show/6381.